Ric Furman (left, photo by Elise Bakketun) impressed Seattle Opera's audience on Sunday with his one-day only performance as Florestan. (Mr. Furman's appearance was announced HERE.) New fans of Mr. Furman include Philippa Kiraly, who wrote in The SunBreak "Another big voice of beautiful timbre, he also had no difficulty with Florestan’s vocal part" and Bernard Jacobson, who reported for Seen and Heard International that "he was thoroughly compelling in his evocation first of utter despair and eventually of exultant joy." I got a (belated!) chance to check in with him about his career and his experience with Fidelio. Congratulations on a successful debut, Ric! Now, you just recently made the switch to heroic tenor rep. How did that come about? Tell us about your experience as a heldentenor so far. I was singing lyric tenor roles until a couple years ago, when I sang one of the Meisters in Die Meistersinger von Nürnberg. Some members of the cast suggested I look more seriously at Wagner and heldentenor rep in general. The suggestion was also made by my voice teacher, Mark Oswald. I can remember standing in my kitchen thinking about the advice I had been given from people I trust and respect and decided to grab a score and try it. Maybe it was a fit of arrogance, but I grabbed a score, a recording, and started singing Siegfried. I was amazed at how well it worked! I kept playing with other music of the rep and it also felt weirdly good. So, I walked into my next lesson with Mark with a whole new list of music and Florestan was the first thing I pulled out in that lesson. I have loved the experience, and being here at Seattle Opera has been a highlight in that journey. Have you sung this role before? Or other music by Beethoven? This is my first Florestan; my only prior experience with Beethoven has been with his choral music. Beethoven definitely has his own musical language and style which is definitely challenging and requires all your attention. It's equally as rewarding. I received some really great advice from a vocal coach, who advised that singers should listen to Beethoven's piano works and sing his music that way. It really helped! What's the hardest part of this opera for you? At the end there is a gorgeous number with everybody on stage singing a hymn of thanks, this soft beautiful music. Florestan’s music at that point is really challenging for me. The role requires you to get ahead of it with technique and embrace Beethoven's musical language. Marcy Stonikas and Ric Furman singing "O Namenlose Freude"
How did Florestan end up in prison in the first place? What kind of man is he, what's his relationship like with Leonore? I like Florestan very much. He is strong and outspoken and almost completely fearless. He's that friend we all have that always speaks their mind and frequently gets in trouble because of it. He was born into a family of influence and has devoted his life to fighting for the rights of others--that's why he and Pizarro became enemies. Pizarro is a tyrant, a bully, an oppressor and a murderer. Florestan chose to take Pizarro on and denounce him publicly. Pizarro simply abducted Florestan under cover of darkness and hid him in a remote, deep, dark part of his prison. 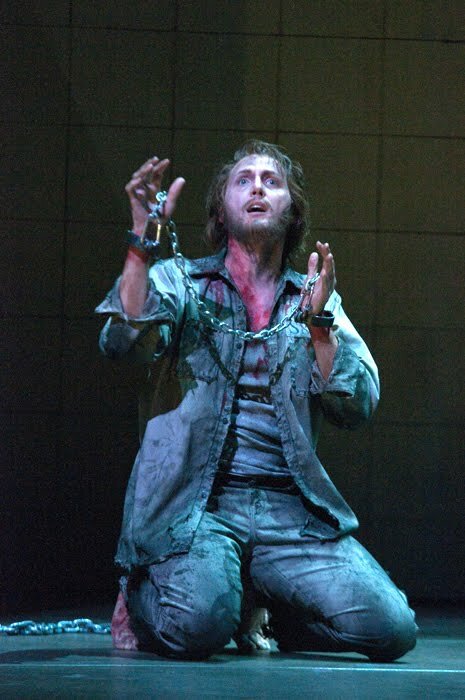 By the time we see him in this opera, Florestan has been tortured, starved, and locked up for two years. He's barely hanging on to both life and sanity. But he has not lost his conviction or his will to fight! He only fears letting down those who depend on him, particularly Leonore. It's an amazingly perfect fit, Florestan and Leonore. They're one of the most idyllic couples in all of opera. Speight Jenkins, Seattle Opera's General Director, likes to say you should always do Fidelio in contemporary dress. What do you think about trying to make this opera "relevant"? That's the beauty of Fidelio, you don't have to try to make it relevant; it IS relevant. I think the contemporary setting of the show lets you hear and feel the message more directly. One of my most memorable moments in rehearsal was when Chris Alexander said to me, "The minute you try to illustrate anything we lose it. You have to be honest. I want you to be as honest as possible." There isn’t a need to illustrate the story, or distract from the pure message of the libretto. We want it to be transparent.